The Green Ribbon Coalition (GRC) is proposing changes along the Cleveland lakefront on the east side of the city that could open up a number of opportunities to increase and enhance the amount of land for public use, improve connectivity along the lakefront, and increase the economic value and livability of the adjacent St. Clair-Superior and Glenville neighborhoods. Consider the best use for the former First Energy Lakeshore Plant, the GRC has proposed the relocation of Interstate 90 (East Shoreway) south of its current alignment through the First Energy site, before ascending eastward along the southern edge of the city’s Gordon Park. Historically, Gordon Park extended to the lakefront with recreational trails, beautiful landscaping and a meandering Doan Brook en route to a popular beach area. 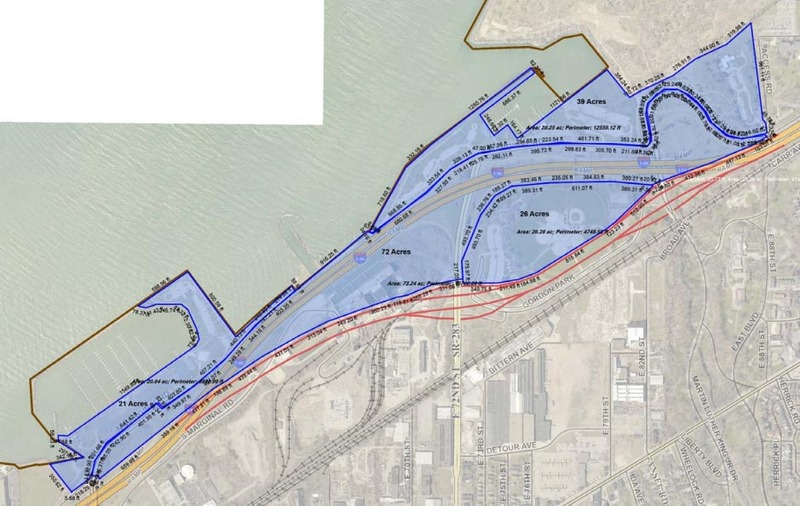 GRC proposes re-connecting Gordon Park with Cleveland Metroparks’ Lakefront Reservation and restoring these amenities. During the early part of the century the land was filled in, the power plant was built, and later, the East Shoreway severed the park (Figure 1 in pdf). 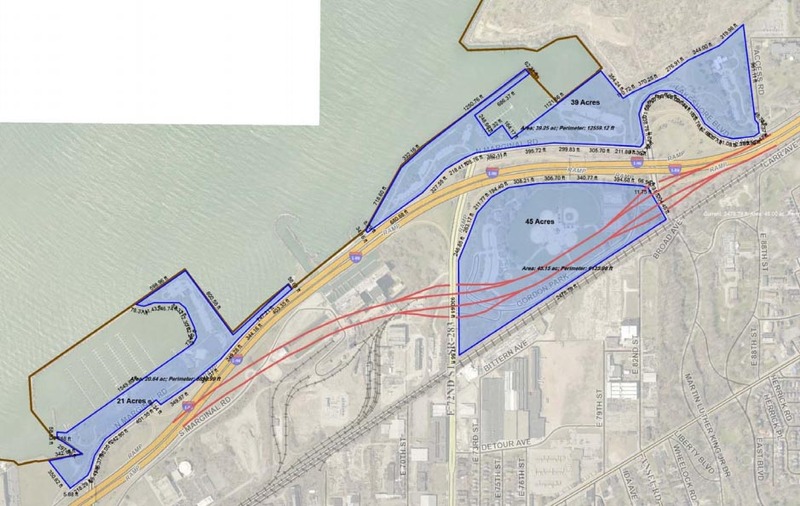 The East Shoreway relocation concept and Gordon Park reconnection has been discussed in the past by others in the Greater Cleveland community in a general sense. The Green Ribbon Coalition is developing concept plans that suggest a more specific layout for further consideration and detailed planning. Currently, the City of Cleveland’s Gordon Park property south of I-90 is isolated from Cleveland Metroparks’ marinas, boat ramps, fishing piers and all-purpose trails. The city park is underutilized by both the adjoining community and by users of the Metroparks. To the west of Gordon Park, I-90 runs between the lake and the former First Energy power plant that was built close to the lake to accommodate its large-volume, cooling water needs. These conditions created a pinch point that bisected North Marginal Road and made travel between lakefront destinations disorienting, requiring the use of the freeway to make connections to adjacent facilities. By realigning the East Shoreway per GRC’s concept plans, these challenges can be addressed and a number of opportunities can be created. The plans suggest relocating the Shoreway as far south as possible without interfering with the existing electric substations and other critical infrastructure and considering topology and other natural features.